Far more than a “how-to” book, WIN Without Competing! is an almost Zen-like approach to that most dreaded of all occupations, the job search. Instead of focusing on what the other applicant has to offer, Arlene Barro suggests looking inside in a self-analysis that culminates with the discovery of your “core identity.” Once you know who you are, it's a much shorter, more efficient trip to success and self-realization. In essence, with the Barro method, you're re-recreating yourself as the “perfect fit” for the position. Ergo, you have no competition. In addition to her own inspirational style, Dr. Barro provides a number of compelling anecdotes about life on the career carousel, illustrating winning tactics with a few cautionary tales sprinkled in about careers that crashed on the launch pad. From the fine-tuned résumé to the appropriately firm handshake during the job interview, Dr. Barro covers it all with keen intelligence and good humor. 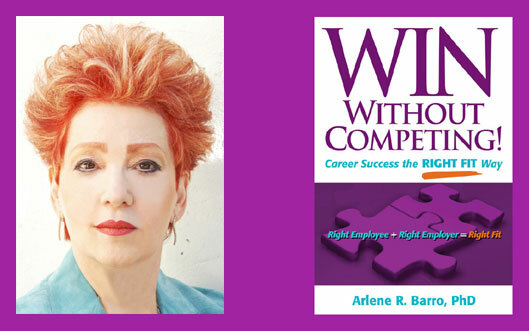 Dr. Arlene Barro’s new book, WIN Without Competing!, makes the many secrets of her proven method readily available for recruitment professionals, and, believe me, they really work. While consulting with Dr. Barro on numerous executive searches, I discovered how defining the sole Right Fit candidate for each open position could eliminate the need to hire on gut instinct from a wide pool of candidates. Employing her Right Fit Method, we have dramatically reduced screening time, and are proud of our one hundred percent retention rate of the stellar candidates her method brought to us. I highly recommend that HR professionals apply the principles detailed in Dr. Barro’s book to all their hiring needs. WIN Without Competing! sets a standard against which no one can compete. Understanding all the players, Dr. Barro—in a supportive, nurturing, and inspiring style—presents a convincing argument for her Right Fit Method, a career search tool that enables all sides to win. In my experience, both in recruiting talent and in my own professional career, identifying the Right Fit is the key. If equal energy were applied to identifying the right position, the right company, and the right talent, resources would not be wasted and better outcomes would be achieved. I recommend taking the time to implement the Right Fit Method not only during your career search but also throughout your life. I envision candidates, employees, entrepreneurs, employers, and human resources professionals using the Right Fit Method and achieving stellar results. WIN Without Competing! lays out Dr. Arlene Barro’s innovative approach to both finding the right position and hiring Right Fit candidates in a clear, insightful, step-by-step manner. I worked with Dr. Barro on a key hire and have seen her Right Fit Method in action. Reading the book gave me additional insights into hiring and managing talented people without the guess work. Win Without Competing! is an essential read, whether you’re an employer searching for the right employee, an individual searching for the right position, or simply a person looking to reach your potential in an existing one. Dr. Barro really puts forward a very compelling approach to attaining personal success and satisfaction not only in your job but also in your life. As exemplified in the career journeys of her ‘storytellers,’ her Right Fit Method works both for recruiters and for those seeking to attain their full career potential. As a result, her book WIN Without Competing! is a must reference source for job seekers and human resources professionals in every field. Importantly, Dr. Barro’s writing style makes the book entertaining reading. —John W. Fara, PhD, Chairman and CEO, Depomed, Inc.
To get the position of your dreams, can you really win without competing? You bet you can. Applying Dr. Arlene Barro’s Right Fit Method to your work setting, your career, and even to your personal life is not only possible, it’s the only way to ensure success. Dr. Barro’s expert advice, combined with her entertaining storytelling, makes WIN Without Competing! a “must read” for everyone who yearns for a deeply satisfying and meaningful professional and personal life. Whether you’re an employee, employer, or an entrepreneur, you’ll be fascinated by this “page turner” full of real-life stories demonstrating that the good guys can indeed finish first. —Patti Rager, Former Chairman, Nursing Spectrum, a division of Gannett Company, Inc.